Isolated within the wilds of Mendocino County lies Germain-Robin, America’s most prestigious brandy producer. Established in 1982, Germain-Robin has been a leader in the domestic craft spirits movement for over three decades, and has set a standard of excellence that is often emulated but rarely matched. Germain-Robin's genesis is the result of the combined vision of two strangers who met by chance. Ansley Coale, whose name hearkens back to an earlier period in American history, was a wayfaring scholar who, on a whim, purchased a 2,100 acre ranch outside of Ukiah in the early 1970s for a song. For years the ranch remained uncultivated, save for a few sheep, while Coale slowly saved his money. He intended to plant grape vines in 1981, but those plans changed after he picked up a hitchhiker. Coale knew the young traveler was European by the way he held out his thumb—straight up over his head as opposed to off to the side. The hitchhiker turned out to be Hubert Germain-Robin, a man on a quest. Hubert Germain-Robin came from a distinguished family that had been producing Cognac under the label Jules Robin since 1782. Born with a desire to take over his family’s business, Germain-Robin’s dreams were thwarted when his parents sold their small operation to Martell, one of the largest forces in Cognac. Following the sale, Germain-Robin took his skills to the new world, seeking a fresh environment in which to ply the family trade. While traveling through Northern California, Germain-Robin ended up in Coale’s car, and before the drive was over, Germain-Robin was born. 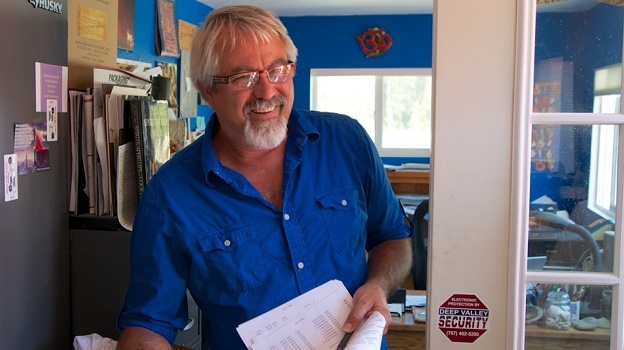 Germain-Robin founder Ansley Coale in his warehouse. Once the partnership became official, Hubert Germain-Robin travelled back to Cognac and acquired an old antique still (an machine used to distill liquids and produce spirits) from the 1930s that he had shipped to California. The two men built a modest facility on Coale’s ranch and distilled 12 barrels of brandy that fall. In the time since, the scope of the operation has grown slowly, and today Germain-Robin produces around 5,500-6,000 cases, spread across 16 different grape brandies, 2 apple brandies, 2 pear liqueurs and 4 grappas. The new, expanded facility includes a warehouse that contains around 60,000 cases worth of aging brandy, a small portion of which dates back to 1982, the inaugural vintage. Since that critical moment, Germain-Robin’s has focused on high quality wine grapes sourced entirely from Mendocino County. This is a significant point of differentiation from their peers in Cognac, who rely heavily on the pedestrian Ugni Blanc (also known as Trebbiano) for their brandies. Although they quickly settled on their sources, Coale and Germain-Robin still had to learn how to handle their grapes. “That first vintage, we were riffing off of Cognac harvest sugars. The result was that we picked way, way too early (17 Brix) for this climate. In the cellar, it was like trying to crush a million tiny rocks,” adds Coale. The pair quickly learned to wait for the grapes to soften and today they pick at around 18-20 Brix, similar to the harvest levels employed by many domestic sparkling wine producers. It also took them a handful of years to perfect fermentations, which Coale said they had in hand by 1984. In Cognac, it is not uncommon for grapes to be pressed into non-temperature controlled tanks and left to spontaneously ferment. Once again, Coale and Germain-Robin decided that the traditional Cognac approach was not necessarily the best method in California. They found that by closely controlling fermentation – using a bladder press, inoculating with Champagne yeast, employing temperature controlled tanks, and monitoring malolactic fermentations – they could achieve another significant step up in quality. “Only by 1989 did we have it all figured out,” explained Coale, “the viticulture was the last thing to fall into place. Most of the growers we dealt with didn’t know how to farm for such low harvest sugars.” It was a learning process for all, and at all levels. Germain-Robin released their first spirit – Fine Alambic (called Craft Method since 2009) in 1987. To drum up publicity, they organized a series of blind tasting panels to show their Alambic against some well known Cognacs such as Delamain’s Pale and Dry, Rémy Martin’s VSOP, Martell’s Cordon Bleu, and a handful of Cognacs from smaller producers. In all four instances, the Germain-Robin triumphed. Indeed, Frank Prial’s column in the New York Times regularly praised the Germain-Robin brandies, as have myriad trade and consumer magazines since. Germain-Robin’s spirits have also been the darling of several Presidents – most notably Ronald Reagan and Bill Clinton. For decades Germain-Robin enjoyed a good measure of success and prestige, but their identity was bound by constant comparisons to Cognac. And while there are certainly some similarities, there are more than enough differences to render direct comparisons meaningless. Happily, Germain-Robin seems to be entering a new phase in its evolution, and is now aligned more closely with the rapidly developing American craft spirits market, rather than with Cognac, per se. “Our sales are up 40% this year without any extra effort on our part,” Coale reports; growth he attributes not only to the artisan spirits movement sweeping the US, but also to a shift in demographics away from the cigar-and-armchair set and towards a new generation of drinkers who seem more interested in innovation than tradition. Positioning themselves as more of an artisan domestic brandy producer and less of a Cognac offshoot affords Germain-Robin even more flexibility and opportunities for creativity. For example, Coale and his new production director Joe Corley have recently taken a deeper interest in aromatic varieties such as Riesling, Muscat and Viognier. In fact, their Craft Method brandy, one of the largest production spirits in the range, will soon include a 10-15% aromatic grapes. Of course, that and any other new experiments are at least five years away from hitting the market. Hubert Germain-Robin left the company in 2006 to pursue a second-career as a consultant. 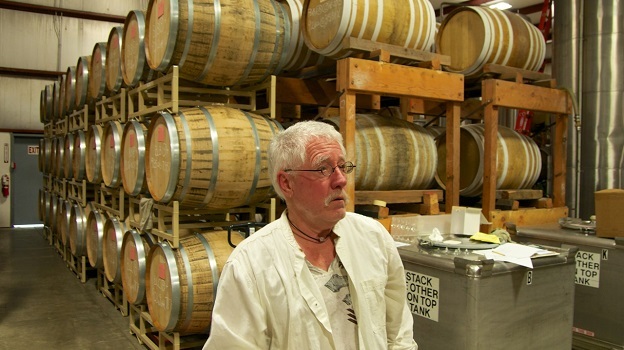 Replacing him behind the controls is Joe Corley, who came up in the Washington wine industry under veteran winemaker David Lake. Corley trained for seven years under Hubert Germain-Robin prior to his departure. A few small changes are in the works, but much has remained consistent. For their source material, Germain-Robin pulls from a range of vineyards and grapes, but their preferred varieties are Colombard, Chenin Blanc, Semillon and Sauvignon Blanc. Colombard, which was once a significant variety in Cognac (it is still planted in the region, but plays a minor role today), is especially important to Germain-Robin, and increasingly hard to find. “We are now paying Cabernet prices for Colombard,” says Coale, “just to keep it in the ground.” This is not an insignificant expense, as it takes roughly 6 tons of grapes (the equivalent of 12 barrels of wine) to make a single barrel of brandy. Germain-Robin purchases grapes that they have fermented at three local wineries; the exception to this is the already fermented Pinot Noir they buy from Roederer. Because sulphur can produce off-aromas in the brandies, no sulphur is employed in the winery and very little used in the vineyards. Tannins also are problematic, so skin contact is avoided. Meticulous attention to temperature control refrigeration allows Germain-Robin to keep their wines in tank unsulphured (and unprotected) for up to three months following harvest, but even so the entire year’s production is distilled over only a four-month period of time. 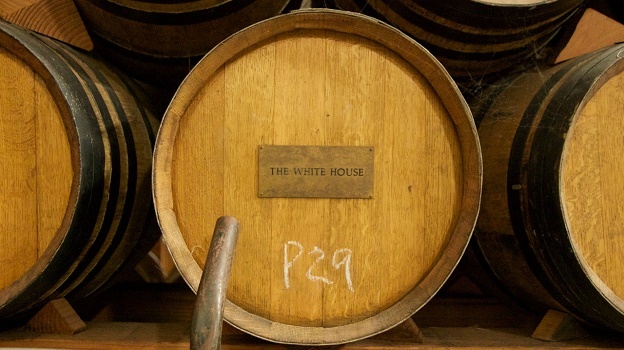 The different varieties are fermented and distilled separately; and vineyard sources are often kept independent as well. The alambic still currently utilized by Germain-Robin dates from the 1950s. Having an antique still is critical, as it pre-dates automation, and helps ensure that the process is manually controlled at each step. Coale likens such a still to a frying pan. 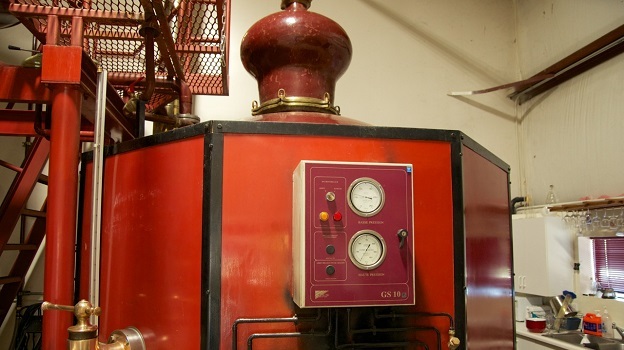 “It’s a simple device but useful device, and the outcome is solely dependent on the quality of the ingredients and the skill of the operator.” Six-hundred gallon batches of wine are run through the pot still twice, with each distillation taking 10 - 12 hours to complete. The first run, which produces the cloudy ‘brouillis’, cuts the volume by a third and increases the proof (alcoholic strength) by a factor of three. The second run yields an even smaller amount of pure, clear grape spirit weighing in around 70% alcohol. Coale is quick to downplay the role of distillation, arguing that the true art and soul of brandy production lies in blending and the aging. 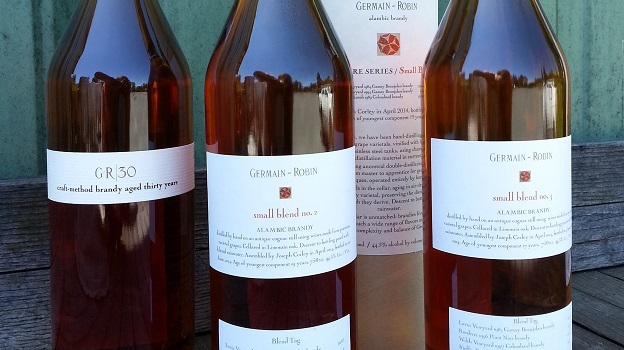 All of Germain-Robin’s brandies are aged in standard Cognac barrels (350 liters, or 92 gallons) coopered by Vicard exclusively from Limousin oak using staves that have been air-dried for four years. 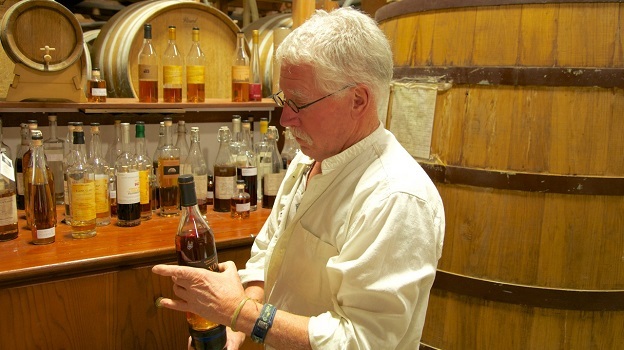 The young brandies, including the Craft Method and Coast Road Reserve, are aged in new oak, while the older brandies are aged in used barrels to avoid excessive oak influence. Blending is an intense process at Germain-Robin. The blends are revisited so often over such a long period of time that by the time a brandy is bottled, the paperwork tracing all of its components can be several inches thick. For example, blending for the XO (aged for an average of 17 years) begins years prior to bottling. Every barrel is tasted and a cursory blend is assembled in tank, at which point the proof is brought down by 4-5% before the spirit is racked back into barrel. Every year this process is repeated, with the blend revisited and the proof adjusted down another 4-5%, until the brandy reaches a bottling strength of between 40 – 44% alcohol. This slow blending and the gentle lowering of the proof makes for a seamless spirit with notable integration of flavor. All proof adjustments are made using rainwater that Germain-Robin collects on site and charcoal filters. Once the final blends are determined and proofs are properly adjusted, the brandies are cold-stabilized and subjected to a light “polishing filtration” that removes any oils or fatty acids. A touch of caramel is added for color stabilization in the three main products (Craft Method, Coast Road Reserve, and Select Barrel XO), but not for the single barrels or specialty products. The single-barrel brandies are also unfiltered. 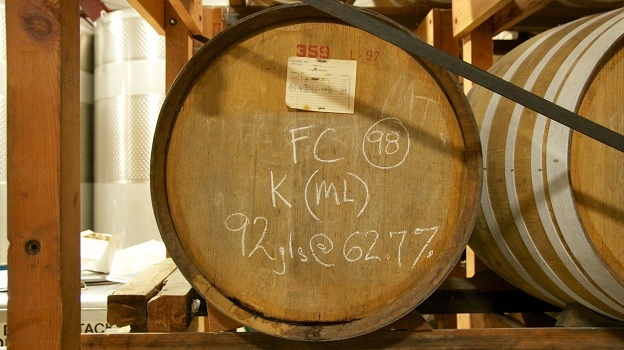 Decoding Germain-Robin: the markings on this barrel ‘FC(98) K(ML)’ indicate that the contents are 1998 French Colombard from the Kiefer Vineyard that went through malolactic fermentation. When tasting through Germain-Robin’s portfolio of spirits, it is easy to see why so many people have been so impressed. These are, across the board, exceptionally smooth brandies that cause neither burn on the palate or recoil on the nose. The aromatics, too, are gentle, and tend to be subtly fruity or floral as well as woodsy. Simply put, these are completely engaging, impeccably crafted spirits. When comparing to Cognac, the fruity aromatics are obviously a point of departure, but the brandies are quite texturally divergent as well. For all its geologic variation, Anderson Valley lacks the chalk and limestone that define the best vineyards of Cognac, a difference you can feel rather than taste. What Germain-Robin adds in the way of finesse and fragrance, it lacks in terms of tension and mineral depth. This is not a knock against Germain-Robin, just an observation. It is also worth noting that the Germain-Robin brandies are not inexpensive, although quality across the board is very high. - Because evaporation does take place in an opened bottle, some collectors add marbles to the brandy as it is depleted to keep the level full. Ansley Coale doesn’t bother with this, but he will pour an especially fine spirit into an empty half bottle when he’s consumed over 50% of the contents.